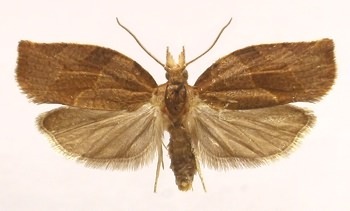 Class Insecta, order Lepidoptera, family Tortricidae, subfamily Tortricinae, tribe Archipini, genus Pandemis. It is a polyphagous pest of garden, park, and forest cultures. Fore wings brown or red-brown (wingspan 17-20 mm). Triangular pretornal area, wide median band, and oval sub-apical spot are somewhat darker. Narrow external marginal spot goes from sub-apical spot toward back corner. Hind wings dark brown or gray-brown. Eggs are lentiform, slightly lengthened, light green. Fifth instar caterpillars are bright-green or light-green. Pupae are dark-brown, 9-12 mm long. Cremaster flat, bent ventrad. Fertility is up to 440-480 eggs. Female usually lays eggs in light green shields on the upper side of leaves, 10-180 eggs in a batch. Young caterpillars stay closely-grouped, with 5 individuals in a group, then spreading in a crown. Diapausing caterpillars of 1st-3rd instars (or 2nd-3rd instars in the south) winter in silky cocoons in bark cracks, on trunks and skeletal branches, in forks of branches. Diapausing caterpillars appear starting at the end of August. After having left winter cocoons, the caterpillars injure blossoming buds, gnaw round plaited flowers and only occasionally penetrate into generative organs. Caterpillars of older instars develop in tubes of 1-5 leaves, often on tips of twigs; they gnaw round flowers, ovaries, and fruits. Pupation occurs in feeding places or in leaves that are intact but strapped with silk threads. It lives in Western Europe (everywhere), Asia Minor, Mongolia, China, Japan, the Himalayas, Canada (adventive). In the former USSR it is distributed everywhere, except for the Far North and republics of Central Asia. Beyond the Urals it is known in the south of Siberia and the Russian Far East. It is monovoltine in the north of the European part of Russia, bivoltine in Moldova, Ukraine, Ciscaucasia and southern Primorskii Territory. In spring the caterpillars appear and restart their feeding from apple bud blooming until flowering, i.e., at daily average air temperature 12-15°C in the Ukraine, and at 15-17°C in the Moscow region. Optimum conditions for their development are temperatures of 18-22°C and relative air humidity of 80-90%. The lower threshold of caterpillar and pupa development in Krasnodar Territory occurs at 10°C. Development of eggs lasts 7 days at the average temperature of 24.5°C and relative air humidity of 66%, and 13 days at 19°C and 50% humidity. Development of caterpillars lasts 27 days at the temperature of 22°C and air humidity of 68%; development of pupae lasts 10 days at 21°C and 67% humidity. Caterpillars passively migrate on silk threads with the help of the wind. Moth flight occurs from the middle of July until the middle of August in the zone of 1 generation (Moscow suburbs), from the middle of May until the middle of July and from the middle of August until the end of September in the zone of 2 generations (Krasnodar Territory). This is a pest of apple orchards, especially in conditions of irrigation floodplain gardening in the center and south of the European part of the former USSR (Moldova, Ukraine, Krasnodar Territory, Ciscaucasia). Caterpillars destroy up to 26-66% of ovaries in addition to plenty of leaf rosettes and flower buds. Injured apples partly rot on trees. The pest also causes damage to cherry, pear, mountain ash, bird cherry, currant, hop, bilberry, wild strawberry, and other garden, park, and forest plants in addition to apple and plums (which are optimum for insect development). Agronomical measures include pruning old and diseased branches. Biological measures include application of biological preparations. Chemical measures include local insecticide treatments during development of 2nd-instar caterpillars before flowering. Monitoring and forecast are possible with the use of pheromone traps.